SPREADING THE WORD ON SUSTAINABLE FINANCE AND FINANCIAL INCLUSION – Dr. Felipe Calderon of the Asian Institute of Management spoke recently at a forum organized by the Maybank Foundation in coordination with the Bangko Sentral ng Pilipinas. With the objective of advancing Environment, Social, and Governance (ESG) initiatives, the forum was attended by close to 200 participants from various sectors. Dr. Calderon tackled “The Importance of ESG in companies operating in the Philippines”, citing academic research on different corporate initiatives. He was joined by BSP Governor Nestor Espenilla and BSP Managing Director Pia Bernadette Roman Tayag, among others. 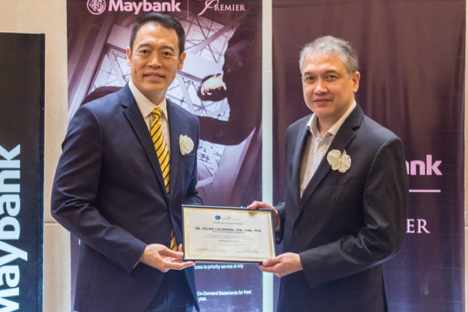 Maybank Foundation Chief Executive Officer Shahril Azuar Jimin, took the example of Maybank Group’s ESG strategy as a regional strength in advancing responsible financing, and successfully driving it in ASEA. He presented the strong progress under the Reach Independence & Social Entrepreneurship (R.I.S.E.) Program in SEA, including the Philippines’ impressive comparative progress results in the rise of income for persons with disabilities based on financial training and coaching granted by the Foundation.